Among climate scientists John Church is a global leader who has laboured over decades to understand sea level rise. Now that labour has been properly rewarded. 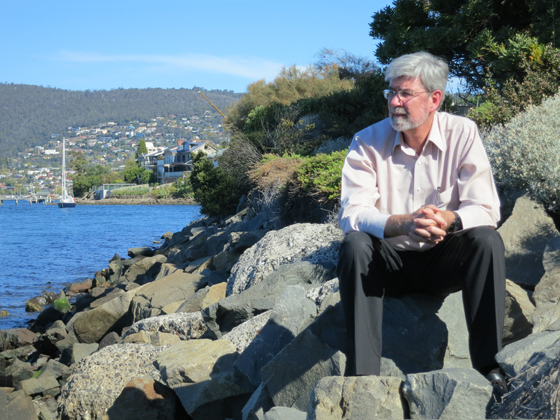 The huge contribution by Hobart oceanographer John Church to the world’s understanding of how our sea levels are changing has at last got the broad global recognition it richly deserves. This month the Spanish BBVA Foundation announced Church as one of three joint winners in the climate change category of its 2019 Frontiers of Knowledge Award. Worth €400,000 ($A636,000), the award’s global reputation approaches that of the Nobel Prize. The two others sharing the award are French geodesist Anny Cazenave, who specialises in satellite altimetry, and British climatologist Johnathan Gregory, a specialist in ocean heat uptake and climate sensitivity. Both have collaborated with Church in sea level studies. Church had earned a place at the top of world oceanography and climate science long before CSIRO, the organisation he had served all his working life, shocked the world scientific community by declaring him redundant during a purge of climate science positions in 2016. Now the same community has given him an emphatic thumbs-up. This quiet achiever would never say it, but after that experience the Frontiers of Knowledge Award must be especially gratifying. Church quickly moved on, accepting a professorship offered to him by the University of NSW. As a senior research scientist with the university’s Sydney-based Climate Change Research Centre, he is able to continue living in Hobart. Born in 1951, Church was raised and educated in Gympie, Queensland. He studied physics and oceanography at the University of Queensland, completing a PhD on water circulation in Moreton Bay, and in 1978 took up a marine science position with CSIRO in Cronulla, NSW. In 1981 CSIRO moved its marine laboratories to Hobart. Church had to choose between Hobart, taking up a marine science position in Townsville or staying in Sydney without a job. He took the cooler option, moving to Tasmania in 1982 with his wife, Majnun, a doctor. His focus widened to the global ocean during a six-month stint in the US, at Woods Hole Research Centre near Boston. A significant turning point in his career came in 1988 when he attended a seminar given by Graeme Pearman, later the leader of CSIRO’s atmospheric research program. Originally trained as a biologist, Pearman identified climate signals as early as the 1970s when he noted species’ responses to changing rainfall patterns. As a leading climatologist he gave climate change briefings to prime ministers Bob Hawke, Paul Keating and John Howard. Pearman’s concerns rubbed off on to Church, whose studies of Pacific Ocean warming led him to investigate how this might affect sea levels. In 1991 he published with three other authors “A model of sea-level rise caused by ocean thermal expansion”. His star was rising and his course was set. Ever the scientist, Church treated the hypothesis of human-induced warming as simply that. But mounting evidence through the 1990s persuaded him to agree to be a co-lead author for the sea level chapter of the third UN international climate science report released in 2001. The scientific reports of the Intergovernmental Panel on Climate Change (there are five so far) are huge intellectual achievements. For the most recent (published 2014), in which Church also had a key role, over 600 contributing authors and 1000 expert reviewers dealt with 9200 scientific papers. Each of those cited papers is an achievement in itself, and Church’s own name featured prominently among them. His published output is prodigious. Since that most recent IPCC report he has authored or co-authored 50-odd papers or book chapters, an average of about eight a year. Church has been a central figure among many scientists from all over the world whose combined efforts have helped identify key causes of sea level rise, improve measuring techniques including precise satellite altimetry and identify the role in all this of human activity. Their analysis is hugely complex. It draws on evidence from ancient coastal geology, centuries of tidal measurement, 25 years of precise satellite observations and high-powered computer modelling of past, present and future change. They have found that seas are not just rising, but rising at an accelerating rate. Their projections for 2100 if emissions remain high are for an average rise between 0.5 and 1 m, at a rate increasing from today’s 3.5 mm a year to more than 10 mm a year. Church emphasises the uncertainty in these estimates because of what we still don’t know about the Antarctic and Greenland ice sheets. Collapse of marine-based ice in Antarctica, for example, would likely push sea levels several tenths of a metre higher this century. In both Antarctica and Greenland, says Church, we are already uncomfortably close to thresholds leading to many metres of sea level rise over coming centuries. Current research in Greenland is uncovering unexpectedly large rates of ice decay in the island’s west. It’s hard to overstate the potential impact of such changes. Millions of people in low-lying countries like Bangladesh and Vietnam will be forced off their land. Other countries with coasts, including Australia, will have to deal with massive and expensive adjustments in coastal management. So what should we do? We obviously have to adapt to substantial change that we cannot avoid, says Church, requiring a lot of planning at local and regional levels. John Church’s great achievement, acknowledged by his peers, has passed the government by. If our political masters can’t learn to listen to these heroes of science, we will all bear a heavy cost.